Tell me, growing up, who was your beauty icon? I heard many tout Angelina Jolie, Jennifer Aniston, Nicole Kidman, Marilyn Monroe, Audrey Hepburn..and the list goes on. In truth, I grew up hadn’t heard of any other non-white celebrity being considered as a beauty icon – as a matter of fact, mine was actually Britney Spears, who is blonde, blue-eyed and obviously white. In case if you haven’t seen me before I am not exactly all those ticked above. With a Pakistani-Indian blood running through my veins, my skin color is inevitable, even if I consider the idea of skin-bleaching, my color literally runs deep. However, that wasn’t the case with my own relatives, they were obsessed with having fairer skin – vitamin c shots, skin bleaching, whitening creams pretty much anything that comes with the word whitening/brightening on the packaging. First comments during family gatherings were always about how tanned you are and to not play in the sun at the risk of being darker, hell I have come across cases where some aunties prefer to babysit cousins/babies with fairer skin than the rest (true story!). This being said, I didn’t come with a horrible upbringing or anything like that, the true issue here is lies on our mindset, it is grimly embedded within our culture on how we approach beauty ideals as a means to success in bagging/attracting a future husband. While I love my relatives very much, they were oblivious to how hurtful some comments could affect the self-esteem of vulnerable girls like I was before, and along with how Malaysian media was glamorising fairer skin, I was left out and in some instances, bullied. With the only person on my side being my mom who tirelessly tried to explain through my thick, angsty teenage skull that I am beautiful, I was stubborn and ended up miserably working too hard to earn popularity in school, succumbing to peer pressure. and hello, teen movies only portray white girls as the hot one and one Asian/Black token hottie that doesn’t even have a say in anything! Then in came Rihanna in the early 2000s, a Bajan beauty with a wide forehead, flattened nose, luxurious choco skintone and a curvy body who gyrated in my MTV screen with her hit Pon De Replay. While at the time we do have black artists like Beyonce, Brandy, Whitney Houston, Mya et al, there was something about the singer that caught my attention. Perhaps it was her exotic roots that captured my admiration, as the only exotic beautiful women at the time I could sort of relate to were Bollywood women (who are all fair-skinned btw), Rihanna was a poster girl I could relate to. Coming from a small Carribean island in central America, she sang with her accent still in tow and didn’t bank in too much with her sexuality like Britney and Beyonce did. As the years progressed, sure there were controversies, bumps in her love life (we’ve all been there)- but she was steadfast and looked ahead, maintaining her humble roots and developed a cult-following for breaking rules in red-carpet dressing to dismissing the concept of toxic girl squad in her circle of friends. She was vocal, tells it like it is, shows it on her face if something displeases her, keeps her focus to her goals and somehow appeared unpretentious, it is either that was a genuine personality of hers or a damn potent, controlled marketing strategy, still, it felt very relatable to me, an outcast. Okay so enough of my very stan rambling of how awesome she is, let’s move forward to 2017; when she finally announces the release of Fenty Beauty. Frankly speaking, I’m no makeup person, but what I do know is that I have been spending a lifetime on buying 3 different shades of foundation just to capture my shade or buying lightening products just so that it eased me to match the tone of the foundation to my skin (after being called ‘hindu paria’ and told by my crushes that I was too dark to be with them). I did eventually found my shade that sticks best to my skintone via Too Faced from Sephora, but I always find myself having to pre-order or find them overseas as they no longer stock my hue in store! Lets not forget the ad campaign itself, which left me sparkle in my eyes as black beauties Duckie Thot and Halima Aden making their appearance in the visuals, with only ONE white girl making the appearance to highlight the diversity the brand offers. After countless of years watching fair-skinned girls dominate ads on TV, imagine how refreshing it is to see people who actually look like you and your friends being represented on screen. On the day of its release, I found out that there were going to be 40 shades of foundation released as well. Out of my curiosity and my journalistic duty to find out what it’s like, I went to Harvey Nichols in Birmingham (as I was on vacation in the Midlands) to check out the spread. Now I have made sure to be very honest and fair when it comes to my reviews of celebrity makeup brands (which are almost always cack!) , so with this in mind and having already settled with the foundation brand that I have been loyal to, I made my way to the counters. I didn’t realize how vast the shade options really were like until I’ve seen it spread out on the counter – the saturation and variation of tones were immense! I’ve been to the States and the UK where they already have stocked darker shade range like Rimmel London, Revlon and Maybelline FIT in Ulta, Boots etc, but I have never actually encountered and in-between shade that matched me so perfectly! I lit up as the Fenty Beauty rep demonstrated one of the Fenty Beauty Pro Filt’r Soft Matte shades like second skin on my skintone (plus points for discovering that my shade was similar to Rihanna’s :p), adding with the Match Stix coverage, I was blown away by the texture on my oily, beat skin. It was magic, it came with the relief of acceptance and inclusion for people who were alienated for their appearance. We’re not just talking about the skintones here, the stereotype of the usual beautiful ‘beauty ad’ woman in this Fenty Beauty swatch guide were changed up to reflect the Fenty Beauty direction. There were ‘unpretty’ women (in the best of ways) , embracing their own unique features – gap tooth, boy cuts and more. I’d like to wrap this up by making it clear that this is not a white-girl bashing/fair-skinner girl post (calm down, internet trolls) but rather, a message to say that we should make best of what we already have. At the end of the day, we need to educate our girls and the future generation that there are things that value beyond our exteriors and that we should fortify our intellectual prowess instead. We are more than capable to inspire change and be an innovator than to limit oneself to rely on beauty. 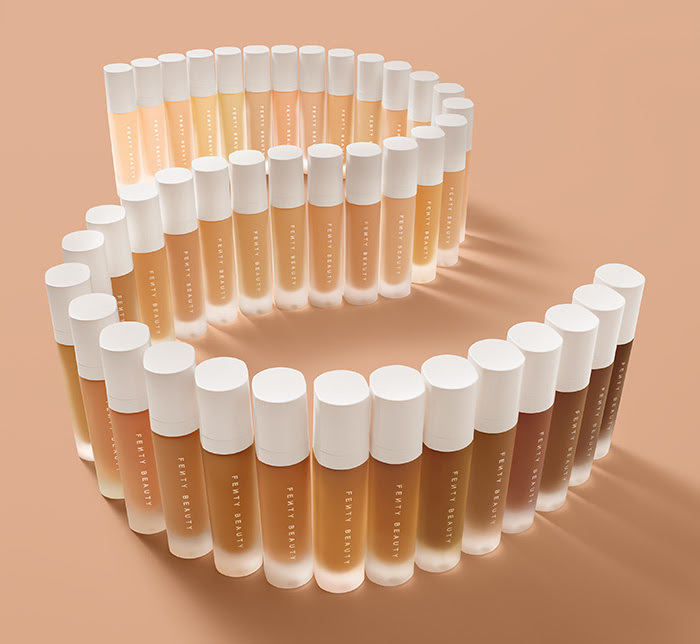 Fenty Beauty provided me not just the satisfaction of looking/feeling beautiful but opened an enthusiasm of embracing the best that I am, what we are and what we all can be to unlock our fullest potential in result. “That was really important for me. In every product I was like: ‘There needs to be something for a dark-skinned girl; there needs to be something for a really pale girl; there needs to be something in-between.’ There’s red undertones, green undertones, blue undertones, pink undertones, yellow undertones — you never know, so you want people to appreciate the product and not feel like: ‘Oh that’s cute, but it only looks good on her.’”- Rihanna.